Barrier-Free New Custom Craftsman Ranch on just under an acre. No HOA - outbuilding & fence OK! Built Sept 2017 with upgrades galore, barrier-free 3 bedroom ranch with large walk-in shower and heated floor master. Granite counter with stone features on counter island, walk-in pantry, tile back splash. Vaulted ceiling great room with gas fireplace and hardwood floors. Jack n Jill bath with dual sinks and tile on secondary bedrooms. Covered patio area for your future deck. Finished and insulated over-sized 3 car garage with 3 garage door openers and insulated doors. Generac 22KW automatic natural gas generator. Built with energy in mind - R49 Ceiling, R21 Walls and 96 Seer efficient forced air furnace. High ceiling basement with finished & insulated walls plumbed for a bath ready for your lower floor finishes. 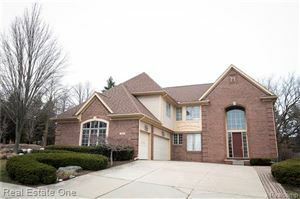 Minutes from I-96 and downtown Howell.